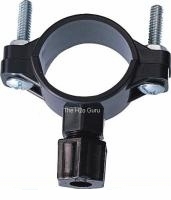 Home >> Components & Installation Supplies >> Valves, Fittings and Tubing >> Drain Clamp for Reverse Osmosis Water System 1/4"
The drain clamp will clamp onto the standard 1 1/2" drain pipe under the sink. It is needed for the Reverse Osmosis water system to drain the rejected water. The connection in this clamp is for 1/4" tubing.